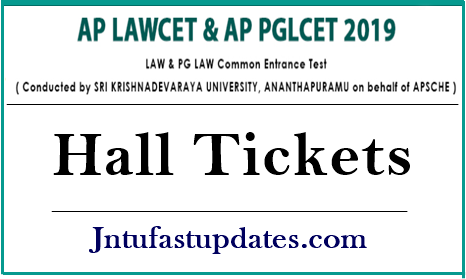 AP LAWCET 2019 Hall Tickets Download: Sri Krishnadevaraya University, Anantapuramu is going to host the LAWCET (Law Common Entrance Test) examination on 6th May 2019. All the hopefuls applied for AP LAWCET 2019, are anxious to download the AP LAWCET admit cards 2019. AP LAWCET Hall Ticket 2019: Candidates are hereby informed that the AP LawCET 2019 hall ticket will be accessible to download from 1st May 2019 from the AP SCHE Official website, sche.ap.gov.in. Hence all the candidates need not worry to download the hall tickets. Simply visit the given website, furnish your details like name, register number, and password etc. That’s it! Your hall ticket will be downloaded instantly. Here we have given the clear step by step process to download AP LAWCET hall ticket 2019. Go through the article to know more details. The AP LAWCET Examination conducted every year by Sri Krishnadevaraya University on behalf of APSCHE. This is the entrance test for aspirants seeking admission into LL.B 3 Year Degree Courses – LL.B, LL.B (Honors) & LL.B (B.A.LL.B) 5 Year Degree Courses – BA.LL.B, BA.LL.B (Honors), BBA.LL.B, and B.Com.LL.B. There are overall 33 law colleges across AP and the available seats are 3020 seats for 5 year LLB (BA LLB – 2780 and B.Com LLB – 240) and 5866 seats for 3 year LLB. Hence the seats are limited, only a few of the competing candidates can get admission to their desired Law courses. The competition is increasing tremendously for LLB 3 year and 5-year courses. To get admission into their favorite course, aspirants must qualify the LAWCET examination with good merit. This year the Sri Krishnadevaraya University is conducting AP LAWCET examination on 06th May across the state of AP in various examination centers. As per reports from SKU, thousands of aspirants were clashing for LAWCET examination this year. All the hopefuls can download AP LAWCET Hall ticket 2019 from the AP SCHE Official website, sche.ap.gov.in from 1st May 2019. Check the following steps to download AP LAWCET Admit Card 2019.